What if you were vengeful and utterly unrestricted by the veil between the physical and the next dimension? That’s exactly what Kate Batts had going for her. 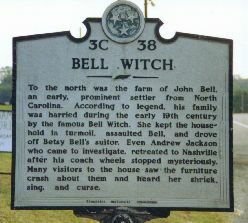 She was a spiteful old woman who believed that she had been cheated in a land purchase by John Bell and was hell bent (literally) on tormenting him and his children, or at least his favorite 12-year old daughter, Betsy. Kate’s wrath was particularly directly at John and his favorite daughter, Betsy. With the wife and other children she was sometimes heard crooning softly, saying something pleasant, or just ignoring them completely. John and Betsy were not so fortunate. Kate enjoyed mentally and physically torturing them with her shrieking voice or physically punishing antics. Gossip moved as quickly then as it does now and this was a much talked about event in the small farming town of Adams, Tennessee. People were deeply fascinated by the rumors and some even came from hundreds of miles away to visit the place of unrest. Some spectators were greeted with handshakes, some with shrieks and some with a full dialog of warning. So popular did the story become that General Andrew Jackson, the future President of the United States, gathered a few friend to investigate the story himself. He and his cohorts wanted to either debunk or repel the feisty spirit of Kate Batts. Jackson and his men were in for a surprise though. When their wagons stuck fast to an otherwise smooth and flat road, their jests of dealing with the witch came to a halt. No matter how they examined, pushed, cursed or whipped the horses, their wagon was not moving. Ịt was said that Jackson, in a fit of frustration and resignation, declared, “By the eternal, boys, it is the witch." Much to the amazement of Jackson and his men, the legendary screech could be heard from a nearby bush that replied, “"All right General, let the wagon move on, I will see you again to-night." Moments later the wagon and horses were suddenly free to move about. There wasn’t a person present that could account for the voice’s owner or its whereabouts. Kate wasn’t miserly in her haunting antics and bestowed upon Jackson and his men the same torturous treatment as she had John and his daughter Betsy. Jackson’s bedcovers were repeatedly yanked from his body and his men were delivered the same pinches and pokes as the family were. Jackson and his men realized they were no match for the Bell witch and hastily abandoned their adventure first thing in the morning.